This is a short piece about how Jonathan Christopher Morgenstern became Sebastian Verlac in City of Glass. It was a very small bar, on a narrow sloping street in a walled town full of shadows. Jonathan Morgenstern had been sitting at the bar for at least a quarter of an hour, finishing a leisurely drink, before he got to his feet and slipped down the long, rickety flight of wooden stairs to the club. The sound of the music seemed to be trying to push its way up through the steps as he made his way downward: he could feel the wood vibrating under his feet. There he was, at the bar, as if he was trying to blend in with the mundanes even though he was invisible to them. Jonathan ordinarily had little interest in anyone his own age — if there was anything duller than other people, it was other adolescents — but Sebastian Verlac was different. Jonathan had chosen him, carefully and specifically. Chosen him the way one might choose an expensive and custom-tailored suit. Jonathan strolled over to him, taking his time and taking the boy’s measure. He had seen photographs, of course, but people always looked different in person. Sebastian was tall — the same height as Jonathan himself, and with the same slender build. His clothes looked like they would fit Jonathan perfectly. His hair was dark — Jonathan would have to dye his own, which was annoying, but not impossible. His eyes were black, too, and his features, though irregular, came together pleasingly: he had a friendly charisma that was attractive. He looked like it was easy for him to trust, easy to smile. “Hello,” Sebastian replied, in English, the language of Idris, though his was tinged faintly with a French accent. His eyes were narrow. He looked very startled to be seen at all, and as if he was wondering what Sebastian might be: fellow Shadowhunter, or a warlock with a sign that didn’t show? Jonathan smiled wider and turned his right hand over to show the Voyance rune on the back of it. The breath went out of Sebastian in relief and he beamed with delighted recognition: as if any Shadowhunter was a comrade and a potential friend. “Are you on your way to Idris, too?” Jonathan asked, very professional, as if he was in regular touch with the Clave. Protecting the innocent, he projected to the world and Sebastian in particular. Can’t get enough of that! He’d researched the Blackthorns, a large family, and knew they and the Verlacs had not been in the same city for ten years. He was certain he would have no problem answering to an assumed name: he never did. His real name was Jonathan, but he had never felt particularly attached to it: perhaps because he had always known that it was not his name alone. The other Jonathan, being raised not so far away, in a house just like his, visited by hisfather. Daddy’s little angel. Jonathan nodded, and tried to look as if he was very focused on searching the room for demons. They stood shoulder-to-shoulder, like brother warriors. It was so easy it was almost boring: all he’d had to do was show up, and here was Sebastian Verlac like a lamb pushing its throat on a blade. Who trusted other people like that? Wanted to be their friend so easily? He had never played nicely with others. Of course, he had not ever been given the opportunity: his father had kept him and the other Jonathan apart. A child with demon blood and a child with angel blood: raise both boys as yours and see who makes daddy proud. The other boy had failed a test when he was younger, and been sent away. Jonathan knew that much. He had passed every test their father had ever set for him. Maybe he had passed them all a little too well, too flawlessly, unfazed by the isolation chamber and the animals, the whip or the hunt. Jonathan had discerned a shadow in Father’s eyes now and then, one that was either grief or doubt. Though what did he have to be grieved over? Why should he doubt? Was Jonathan not the perfect warrior? Was he not everything his father had created him to be? Human being were so puzzling. Jonathan had never liked the idea of the other Jonathan, of Father having another boy, one who made Father smile sometimes at the thought of him without a shadow in his eyes. Jonathan had cut one of his practise dummies off at the knees once, and spent a pleasant day strangling it and disembowelling it, slitting it from neck to navel. When his father had asked why he’d cut off part of the legs, he had told him that he wanted to see what it was like to kill a boy who was just his own size. The Blackthorns really were eight: Jonathan’s research had been thorough. He couldn’t imagine what that would be like, so many people, such untidiness. Jonathan had a blood sister, too, although they had never met. Father had told him about his mother running off when Jonathan was a baby she was pregnant again, inexplicably weepy and miserable because she had some sort of objection to her child being improved. But she’d run away too late: Father had already seen to it that Clarissa would have angelic powers. Only a few weeks ago, Father had met Clarissa for the first time, and on their second encounter Clarissa had proven she knew how to use her power as well. She had sent Father’s ship to the bottom of the ocean. Jonathan despised his mother, who had apparently been such a pathetic weakling that she’d run away from him when he was a baby. And his only interest in the other Jonathan was to prove how superior he was: Father’s real son, by blood, and with the strength of demons and chaos in that blood as well. Clarissa had never chosen to leave him. She had been taken away and been forced to grow up in the midst of mundanes, of all disgusting things. She must have always known she was made of different stuff from everyone around her, meant for utterly different things, power and strangeness crackling beneath her skin. She must have felt like the only creature like her in all the world. She had angel in her, like the other Jonathan, not the infernal blood that ran through his veins. But Jonathan was very much his father’s son as well as anything else: he was like Father made stronger, tempered by the fires of hell. Clarissa was Father’s real daughter too, and who knew what strange brew the combination of Father’s blood and Heaven’s power had formed to run through Clarissa’s veins? She might not be very different from Jonathan himself. The thought excited him in a way he had never been excited before. Clarissa was his sister; she belonged to no one else. She was his. He knew it, because although he did not dream often—that was a human thing—after Father had told him about his sister sinking the ship, he had dreamed of her. Jonathan dreamed of a girl standing in the sea with hair like scarlet smoke coiling over her shoulders, winding and unwinding in the untameable wind. Everything was stormy darkness, and in the raging sea were pieces of wreckage that had once been a boat and bodies floating face down. She looked down on them with cool green eyes and was not afraid. Clarissa had done that, wreaked destruction like that, like he would have. In the dream, he was proud of her. His little sister. In the dream, they were laughing together at all the beautiful ruin around them. They were standing suspended in the sea, it couldn’t hurt them, destruction was their element. Clarissa was looking down as she laughed, trailing her moonlight-white hands in the water. When she lifted up her hands they were dark, dripping: he realized that the seas were all blood. Jonathan jumped, launching himself at the brick wall opposite, and used the force of his rebound to arrow over the demon’s head. He twisted in midair, runed blade in hand, hearing it whistle through the air. The demon froze, staring at him. Already the mask of a girl’s face was beginning to slip, and Jonathan could see the features behind it: clustered eyes like a spider’s, a tusked mouth, open in surprise. None of it disgusted him. The ichor than ran in their veins, ran in his. Not that that inspired, mercy, either. Grinning at Sebastian over the demon’s shoulder, he slashed out with his blade, It cut the demon open as he’d once cut open the dummy, neck to navel. A bubbling scream rent the alley as the demon folded in on itself and disappeared, leaving on a few drops of black blood splattered on the stones. Sebastian looked so surprised when he was killed. It made Jonathan laugh, blade in hand and Sebastian’s throat opening beneath it, hot blood spilling onto his fingers. It wouldn’t do to have Sebastian’s body found at an inconvenient time and the whole game ruined, so Jonathan dragged the body as if he was carrying a drunken friend home through the streets. It was not very far at all to a little bridge, delicate as green filigree or a dead child’s moldy, fragile bones, over the river. Jonathan heaved the corpse over the side and watched it hit the rushing black waters with a splash. The body sank without a trace, and Sebastian forgot it before it had even sunk all the way. He saw the curled fingers, bobbing in the currents as if restored to life and begging for help or at least answers, and thought of his dream. His sister, and a sea of blood. Water had splashed up where the body went down, some of it splattering his sleeve. Baptizing him, with a new name. He was Sebastian now. A group of girls in cocktail dresses passed him, angling their gazes, and one, silvery skirt skimming her thighs, gave him a direct look and a smile. He fell in with the party. “Comment tu t’appelles, beau gosse?” another girl asked him, her voice lightly slurred.What’s your name, pretty boy? He looked to the horizon, and thought of the glass towers of Idris, thought of them enveloped in shadow, flame and ruin. He thought of his sister waiting for him, out there in the wide world. He thought he was going to enjoy being Sebastian. Outtake 2: Simon arrives in Alicante and meets Aline and Sebastian. In the original version of the story, Simon wound up in Idris as a result of Jace’s trickery and not as an accident. I decided I didn’t like that — it made Jace too manupulative and Clary too forgiving of his bad behavior — so I altered it; this is, however, the original first scene in which Simon wakes up in Alicante and meets Sebastian and Aline. Bonus: inclusion of Simon’s mysterious last name. Outtake Three: Valentine and Luke. 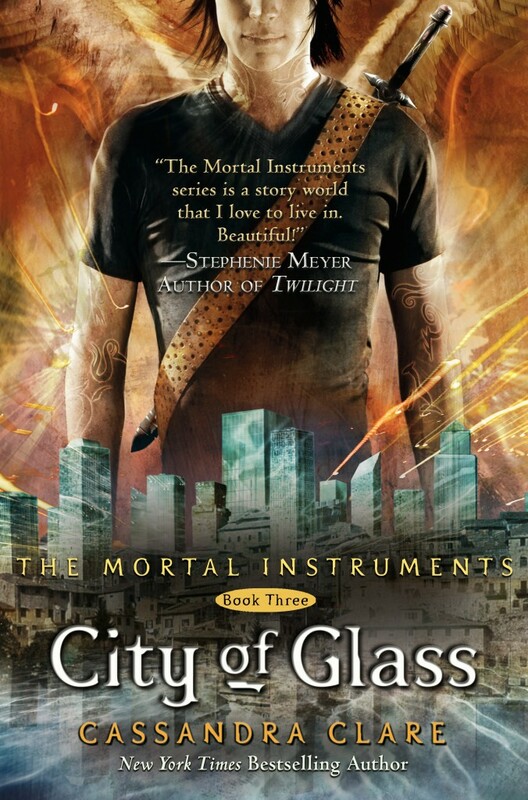 In the orginal first draft of Glass, after the Angel brings Jace back to life, Clary and Jace were met at the lakeside by Alec, Isabelle, Jocelyn and Luke, who have come from the battle to join them. This was changed because in the original draft there was no epilogue; so this was all the closure the characters had. I decided an epilogue was necessary to bring them more, and resolve some of what wasn’t resolved — Magnus and Alec, Jocelyn and Luke’s relationships, for instance. The one thing I was a bit sad to lose was that in the first draft, Valentine had someone to be sorry that he died — in the final version, besides Jace, there really isn’t any mention of it. Outtake from City of Glass: Clary, Sebastian, and Magnus. This is the way the scene that begins on page 160 in City of Glass, where Clary and Sebastian visit Magnus at Ragnor Fell’s cottage, originally read. There was a much more elaborate set-up, which I cut for pacing reasons. Still, the original scene does feature Magnus in harem pants. The roar of the collapse faded slowly, like smoke dissipating into the air. It was replaced by the loud chirruping of startled birds; Clary could see them over Jace’s shoulder, circling curiously against the dark sky. He drew back slightly, propping himself on his elbows, and looked down at her. They were close enough that even in the darkness she could see herself reflected in his eyes; his face was streaked with soot and dirt, the collar of his shirt torn. Without thinking, she reached up, her fingers brushing lightly through his hair. She felt him tense, his eyes darkening. “There was grass — in your hair,” she said by way of explanation. Her mouth was dry; adrenalin sang through her veins, and not just because of the danger she’d just been in. 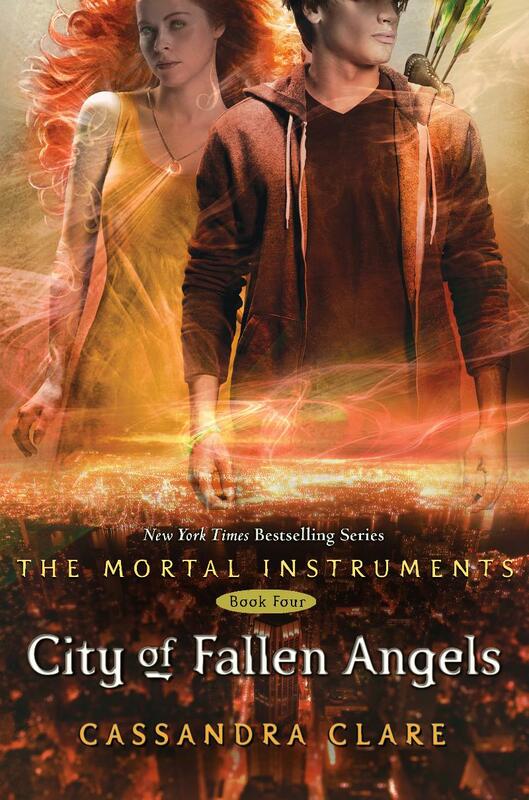 Everything that had just happened: the angel, the shattering manor, seemed less real than what she saw in Jace’s eyes. “You shouldn’t touch me,” he breathed. He was silent for a long moment, staring down at her — for so long, in fact, that she wondered if he ever planned to speak at all, or if just looking was enough; after all, she was staring at him just as helplessly. Their gazes were locked like gears; she could no more have looked away than she could have breathed with water in her lungs. 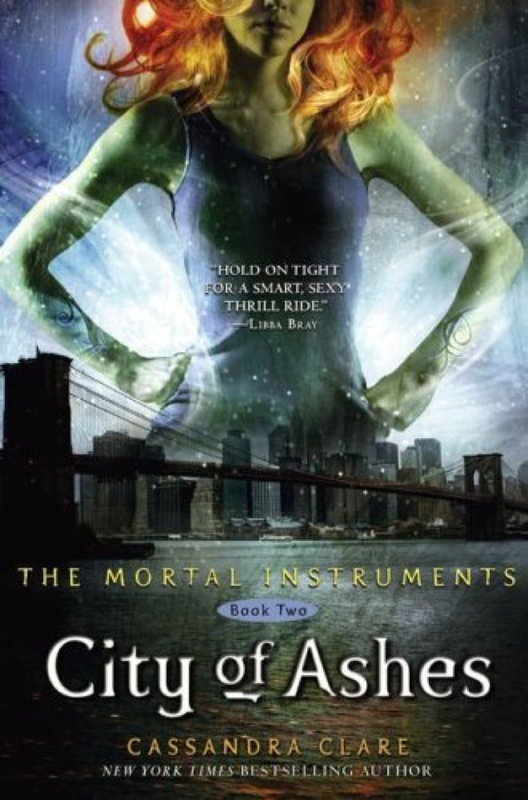 Clary’s breath caught. He was still looking down at her, but his expression had changed — there was a look on his face she’d never seen before, a sleepy, deadly, almost predatory light in his eyes. She was suddenly and acutely conscious of the hard pressure of his body on her body, the bones of his hips fitting themselves against hers, and she ached everywhere that she didn’t touch him, ached with a nearly physical pain. What I want to do to you, he had said. Not thinking of anything else but how much she wanted him, she let her fingers trail down his cheek to his lips, outlining the shape of his mouth with the tip of her index finger. She was rewarded by the catch in his breathing, the sudden darkening of his eyes. He didn’t move. She felt him smile, his lips against her ear. “If you want me to stop, tell me now,” he whispered. When she still said nothing, he brushed his mouth against her hollow of her temple, making her shiver. “Or now.” His lips traced her cheekbones in the lightest of kisses, a butterfly kiss. “Or now.” His mouth traced the line of her jaw. “Or now.” His lips were against hers, his words spoken into her mouth. “Now,” he whispered, and kissed her. At first the pressure of his lips was gentle, seeking; but when she responded instantly — sliding her arms around him, tangling her hands in his hair — she felt the cautious tension in his body change to something else. Suddenly he was kissing her with a bruising pressure, his lips crushing hers. She tasted blood in her mouth, but didn’t care. There were rocks digging into her back, and her shoulder ached where she’d fallen from the window, but she didn’t care about that either. All that existed was Jace; all she felt, hoped, breathed, wanted and saw was Jace. Nothing else mattered. He broke off the kiss, drawing back, and she released him with a soft noise of reluctant protest. His mouth was swollen, his eyes huge and dark, nearly black with desire. He reached for the buttons of her coat, tried to slip the first one free, but his hands were shaking so badly he couldn’t manage it. 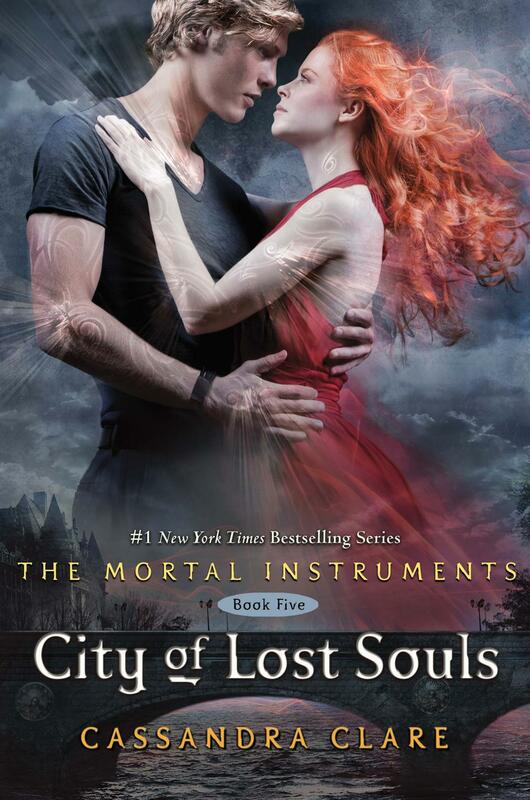 Clary put her hand over his, marveling inwardly at her own calm — surely she should be shaking as badly as he was? He made a stifled noise and fell into her arms like someone coming up for air after nearly drowning. He kissed her eyelids, her cheeks, her throat, before returning to her lips: their kissing was frenzied now, almost clumsy in its fever — so unlike Jace, who never seemed to rush, or to hurry anything . . . Without the coat between them, she could feel the heat of him, burning through his shirt and hers; his hands slipped around her, under her the strap of her bra, tracing her spine, his touch scorching her bare skin. She wanted more of his touch, his hands on her, his skin on her skin — she wanted to be touching him everywhere, to hold him while he trembled like he was trembling now —and for there to be no more space between them. She tugged his jacket off and then somehow his shirt was off, too. Their hands explored each other’s bodies: she ran her fingers down his back and felt soft skin layered over lean muscle, and something she had not expected, though she should have — scars, like thin wires laid across his skin. She supposed they were imperfections, these scars, but they didn’t feel that way to her; they were the marks of Jace’s history, cut into his skin: the raised, topographical map of a life of killing and fighting. She stroked the star-shaped scar on his shoulder and raised herself up to brush her mouth across it. Something banged against her collarbone with a sharp cold shock. She drew back with an exclamation of surprise. “Not really. It was this.” She reached up and touched the silver chain around his neck. On its end hung a small silver circle of metal. It was ice cold to the touch. That ring — the weather-beaten metal with its pattern of stars — she knew that ring. The Morgenstern ring. It had been Valentine’s, and Valentine had passed it along to Jace, as it had always been passed along: father to son. 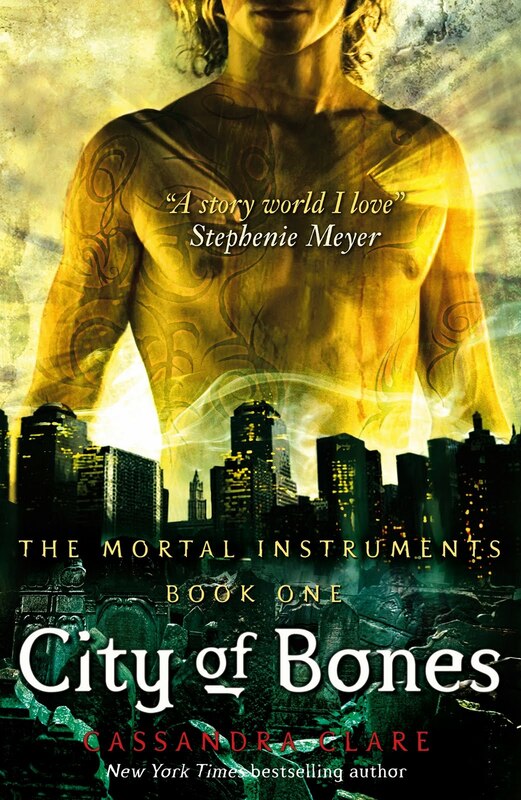 So below is, in fact, the original version of the scene that begins on page 137 in City of Glass. away, throwing his hands up as if to ward Jace off from coming at him again. “I thought you might feel that way.” Jace crossed his arms over his chest.